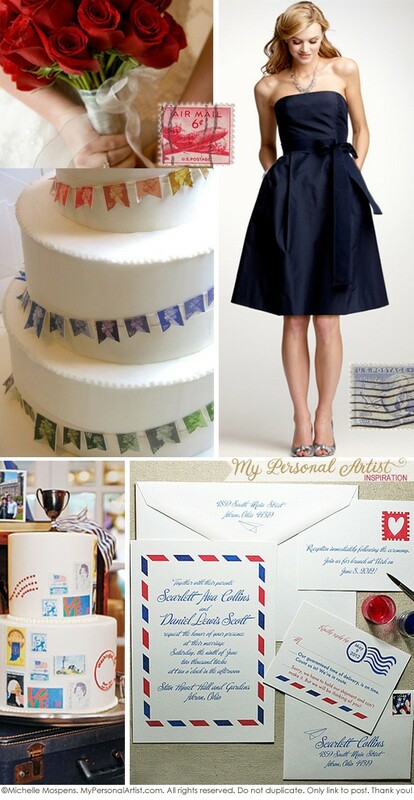 I am in LOVE with a Vintage Stamp, Airmail-Inspired Wedding Theme! Adore!! Paired with navy and red it just seems perfect for this vintage theme. The red roses are timeless, photo from Pink Frosting. The postage stamp garland add a create touch to the cake D.Sharp. 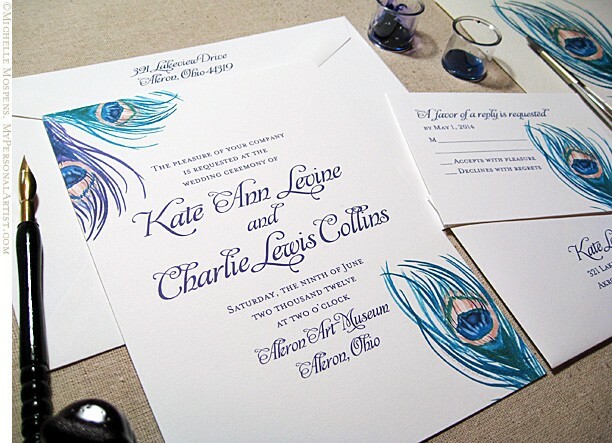 The hand painted airmail-inspired wedding invitations and stationery designs set the tone for your wedding. The navy dress from Ann Taylor is fabulous with the silver shoes. 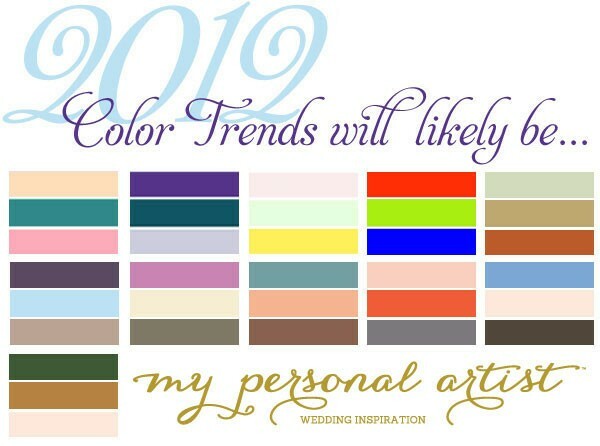 Since 2001, I have been reporting color trends for brides on my website “My Personal Artist.” After much research, from several sources (human and text) I have compiled the colors most likely to trend in 2012. Every single year I truly enjoy predicting what colors will trend a year in advance! Above, the first image, you will find color combos I have created for your viewing pleasure. You certainly can mix and match as you see fit. 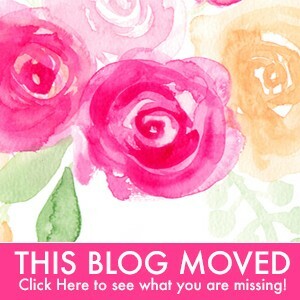 Use this blog post (do not print as image is low res and colors will vary) to share with your wedding vendors. They will assist you in finding the best options for you. Regarding names for these colors, I am not revealing names or color codes. As time goes on when 2012 arrives you will know the names that are being used for said colors. 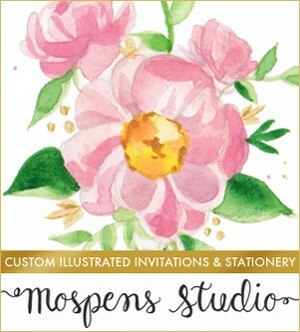 Also, remember to be creative and a bit laid back with your color choices as all vendors may not be able to meet your color needs (ribbon, tablecloths, napkins, dresses, etc.). Again, always ask your vendors in advance and have fun! Â©2012 Michelle Mospens. All rights reserved. Do not duplicate content. Anthropologie’s NEW Wedding Brand: Bridesmaid Dresses and more! S W O O N!! Not only do I LOVE Anthropologie, I adore coral. So, when my eyes captured this adorable dress I just had to share with you! So much more to come from Anthropologie’s new wedding brand BHLDN. I can’t wait! See more at GLAMOUR.COM for now.